Segment an image into regions with somewhat uniform appearance, using the SuperPixel algorithms of OpenCV. The result is an image with a reduced number of grey levels, where each grey level represents the label or ID of a given region (so, all pixels with a given grey value belong to a given region in the image). and you should now see something. To work with a smaller number of super-pixels, you would usually want to first create some software that runs on the host computer and which will grab the greyscale frames from JeVois, then will assign colors to the regions somehow, and finally will display the superpixels in color. For testing, you may want to just capture and save some frames from JeVois (which may look all black) and then use some paint program to change color 0, color 1, etc to more visible colors than very similar shades of black. Definition at line 71 of file SuperPixelSeg.C. Definition at line 75 of file SuperPixelSeg.C. Definition at line 79 of file SuperPixelSeg.C. Definition at line 82 of file SuperPixelSeg.C. 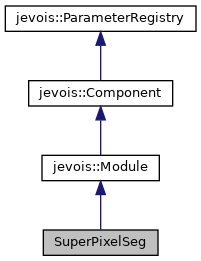 References jevois::rawimage::convertToCvRGB(), jevois::rawimage::cvImage(), jevois::RawImage::height, JEVOIS_REGISTER_MODULE(), jevois::RawImage::require(), jevois::Timer::start(), jevois::Timer::stop(), and jevois::RawImage::width.